1. 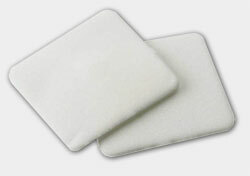 Cut the ITI Foam Dressing (a) to a size that is appropriate for the wound. 2. 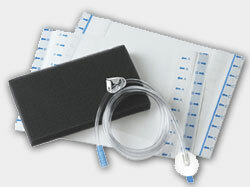 Place the ITI Foam Dressing (a) in the wound site taking care to avoid contact with the periwound tissue. WARNING: Do not pack the ITI Foam Dressings into any areas of the wound. Forcing dressings in a compressed manner into any wound is contrary to approved protocols. 3. Size and trim the ITI Semi-permeable Drape (f) to cover dressing plus a 3-5 cm border of intact skin. (Save the extra drape for later use, if needed). 4. Pat drape material (f) down around the wound site and over the ITI Foam Dressing (a) to ensure dressing is properly sealed. 5. Cut two 1.5 cm diameter holes in the top of the drape at both ends of the dressing. Try to locate these holes as farapart as possible (see Fig. 1). 6. Peel the backing from the SpeedConnect™ tubing flange (d) and place it above one of the holes made in Step 5. Using the tips of the fingers, press around the top of the SpeedConnect™ flange to ensure a good seal to the dressing (see Fig. 2). 7. Repeat Step 6 for the ITI Irrigation tubing flange (g) (see Fig. 3). 8. Connect the ITI Irrigation tube (g) to any standard I.V. giving set or infusion pump. NOTE: The solution to be used for wound irrigation should be appropriate for topical applications (see SVEDMAN® or SVED® Wound Treatment System Indications and Precautions for more information on the suggested types of aqueous wound therapy solutions). Make sure that the irrigation fluid supply remains off until therapy is started (See Therapy Unit Instructions). 9. When Irrigation is discontinued, for example while changing the fluid reservoir, attach the Tubing Cap (e) to the ITI Irrigation tube (g) to prevent leaking. 10. Proceed to the therapy unit Instructions to apply negative pressure wound therapy with irrigation. 1. Ensure that an ITI Fluid Collection Canister (b) is properly placed in the receptacle of the Therapy Unit (c) Note: Always use a new canister with a new patient. 3. Connect the distal end of the SpeedConnect™ tubing (d) with the blue tapered connector to the suction port of the Canister (b). Gently twist and push the connector on just enough to secure and seal it. Also, make sure that the clamp on the SpeedConnect™ tube (d) is open. Insert the “Suction” tube from the Canister (b) to the “SUCTION” connector on the top-front of the Therapy Unit (c). Insert the “Sensing” tube from the Canister (b) to the “SENSING” connector on the top-front of the Therapy Unit (c). The metal tabs on the connectors may need to be depressed to permit tube insertion. 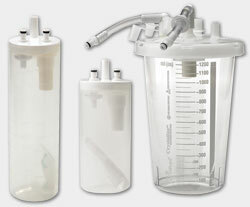 If utilizing the SVED® therapy unit, slide canister into holder and press upwards until the canister locks into place. 5. Plug the Therapy Unit’s A.C. Adapter into a suitable 120 VAC, 60 Hz, outlet. Insert the power plug into the Power Jack on the side of the Therapy Unit. 6. Press the ON (1) button to begin therapy. Check to verify the green button light is illuminated. Adjust the desired therapy level by pressing the appropriate pressure button (-70 mmHg, -120 mmHg or -150 mmHg). Software versions 2.57 and higher can operate in an intermittent suction mode with a 5 minute “on” and 2 minute “off” cycle. To turn the intermittent mode on, press and hold the desired setting button then momentarily press the OFF (0) button. The unit will beep “•—•—“ and the green ON (1) button will begin flashing indicating the unit is now operating in intermittent mode. Release both buttons. To turn the intermittent mode off (and return the device to the default continuous mode), repeat the above steps. The unit will produce a single long beep and the green ON (1) button will steadily illuminate. The unit will remember the mode setting when the power is turned OFF and ON. During intermittent operation, the unit will provide target therapy pressure throughout the “on” part of the cycle and approximately -25 mmHg throughout the “off” part of the cycle. By maintaining this lower pressure while the unit is off, the dressing seal is never compromised. This method of applying intermittent pressure also increases patient comfort. 7. Dressing should collapse, indicating the presence of vacuum. Once dressing integrity is verified, turn the irrigation fluid supply on and adjust flow rate for desired therapy. 8. Carefully check dressing for vacuum or fluid leaks and repair with additional ITI Semipermeable Drape (f) material as needed. 9. The therapy unit (c) should be operated at least 22 out of every 24 hours to prevent possibleinfection.